You will need a writing utensil, paper and a tape measure to measure the size of your cushion. To make sure you order the right amount of foam for your cushions, measurements need to be made. These will be slightly different from the measurements you will record when preparing to create the cushion. Remove the worn-out foam from the cover and measure the greatest length and width across the center of the cover, from one seam to the other. For square or rectangular cushions, this will produce the cushion's full dimensions. 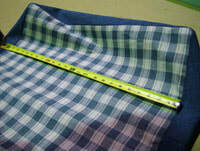 For L or T-cushions, measure the greatest lengths and widths found on the cushion, as you will trim the cutouts later. This may require you measuring ear-to-ear across the front of the cover. Using these measurements, add an additional 1" to the length, width, and thickness. Then, if your cover's thickness exceeds a whole inch by 1/2" or less, round it down to the nearest inch. If your cover's thickness exceeds a whole inch by more than 1/2", round it up to the nearest inch. A measured thickness of 4-1/2" would be increased to 5-1/2" and then rounded down to final value of 5", and a measured thickness of 4-3/4" would be increased to 5-3/4" and rounded up to a final value 6". If you replaced your cushion's old foam after making the measurements for the order, remove it once again for measuring the fit of your cushions. Place the empty cover on a smooth, flat surface and measure across every seam, held taut but not stretched. This time, record each individual side of the cushion. This includes the length and widths of the ears on any L or T-cushions present. It is helpful to sketch a rough diagram on a piece of paper so you can match each measurement with its location on the cushion to reduce the chance of accidentally switching measurements later. Foam Only: If you plan to make a foam-only cushion, there are two adjustments that need to be made to your measurements. First, round every measurement up to the nearest 1/4", including measurements landing on quarter, half or whole inch increments. After this, add 1/2” to each measurement. 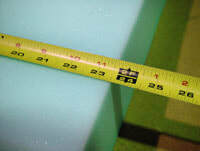 If you rounded a cushion’s length up to 44", increase this measurement to 44-1/2". This increase is also applied to the ears of an L or T-cushion. If a measurement of an L-cushion width is rounded up to be 4-1/4", you would increase the recorded measurement to 4-3/4”. Foam with Dacron Wrap: For making a cushion that will be wrapped in fiberfill, every measurement, including those on L and T-cushions, should be rounded up to the nearest 1/4". This also includes measurements that land on quarter, half or whole inch increments. Unlike a foam-only cushion, no other adjustments need to be made after the rounding. Do NOT decrease your measurements because you feel you’ll have to compensate for the fiberfill layer. These adjusted measurements will be used to create your foam cushion.